What difference does 80 cents make? Here’s a DOCG Chianti for $4.99. That’s 80 cents less than my favorite (to date) Chianti. Should you save that 80 cents for your kid’s college education? Read on. This is another pretty darn good Trader Joe’s wine. And it’s another 4 stars for Tuscan wine. 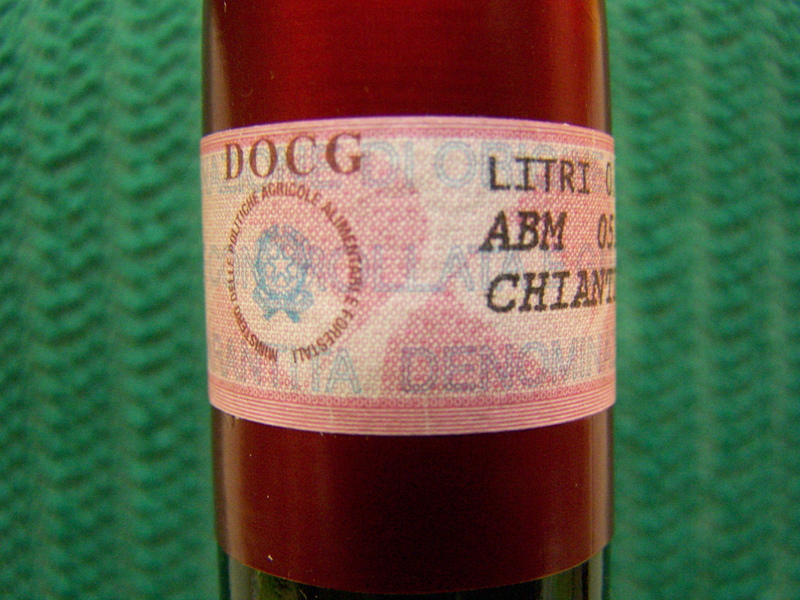 For 80 cents more, you can buy a DOCG Chianti Riserva. Riserva means the wine has been aged at least two years. As in most red wines, a little maturity makes for a mellower wine. The Riserva is a tad smoother than this DOCG Chianti, but in a heads up test, you won’t notice the difference very much, if at all. This is also a very smooth, mellow wine. This wine has a slightly stronger taste than my Riserva comparison wine. That’s a fact, and neither a good nor a bad thing. But by no means is the taste so strong that anyone is going to find it objectionable. What it means is that some of us might like it a little more, and some may like it a little less. For dinner, a stronger tasting wine will hold up a little better against stronger tasting dishes. But it’s mostly a matter of taste. Either is good enough that, in the end, it really won’t matter much. This wine adds confirmation that the Italians take their wine classification system seriously. This is a better wine than those that aren’t classified. Once again, if you have a choice between a DOCG wine and one without, pick the wine with the DOCG seal. This is another Trader Joe’s wine. 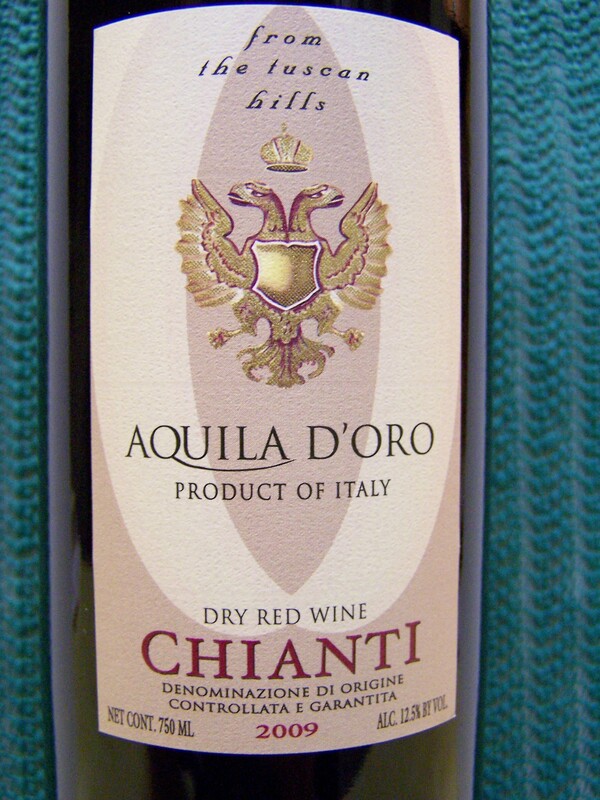 As the shelf stock at TJ’s can vary widely from day-to-day, if you can’t find exactly what you want on TJ’s wine shelf, don’t be afraid to pick up a bottle of Aquila D’Oro Chianti DOCG 2009. Or, take a walk on the wild side and pick up a bottle anyway. You won’t be disappointed. This entry was posted on 02/19/2011 at 09:41 and is filed under Trader Joe's, Wine. You can follow any responses to this entry through the RSS 2.0 feed. You can leave a response, or trackback from your own site. I just found out that Trader joe’s discontinued this wine. Anyone have any idea where i can find it now? It’s my absolute favorite. I just bought a bottle of this as I was perusing the Italian wines trying to lengthen the glow from my recent trip to Italy. Another TJ’s winesumer (wine consumer) was in the Italian wines and recommended this one for $5 and another one for $15. Prior to this I had been enjoying the French Perrin Reserve (best decanted).